What is biodiversity? Simply put, it is the vast array of plants and animals that make up our landscape, from the tiniest soil microbes to gigantic Douglas firs—and everything in between. Biodiversity is critical to the health of our region’s ecosystems and to our own physical and economic health. Ecosystems that have diverse plant and animal life contribute to our clean air and water, fertile soil, and effective crop pollination. They help reduce industrial waste and put food on the table. Biologically diverse ecosystems are more resilient than simpler, species-poor ecosystems, which means that they are better able to withstand disturbances, including climate change. Biodiversity supports economic competitiveness by contributing to quality of life and attracting business and tourism. In addition, the region’s residents take pride in knowing that nature—in all its forms—is nearby. They treasure nature for its inherent value and want to protect fish and wildlife habitat to ensure access to nature where they live, work, and play. The Regional Conservation Strategy is based on a scientific companion document: the Biodiversity Guide for the Greater Portland-Vancouver Region. When The Intertwine Alliance launched the effort to develop the Regional Conservation Strategy, its partners acknowledged that without a sound scientific underpinning, the strategy would lack credibility and be less useful as a guide to protecting the region’s natural resources. The Intertwine Alliance’s steering committee recognized that if the region is to protect biodiversity, a science-based companion document would be needed—a guide that describes the region’s biodiversity. The Biodiversity Guide for the Greater Portland-Vancouver Region, together with mapping and GIS modeling completed specifically for this project, provides important tools for conservation practitioners and decision makers: a narrative that describes the composition and patterns of biodiversity across the region, a land cover map at a scale suitable for analysis of urban and near-urban areas, and a data-driven GIS model of conservation priority areas. 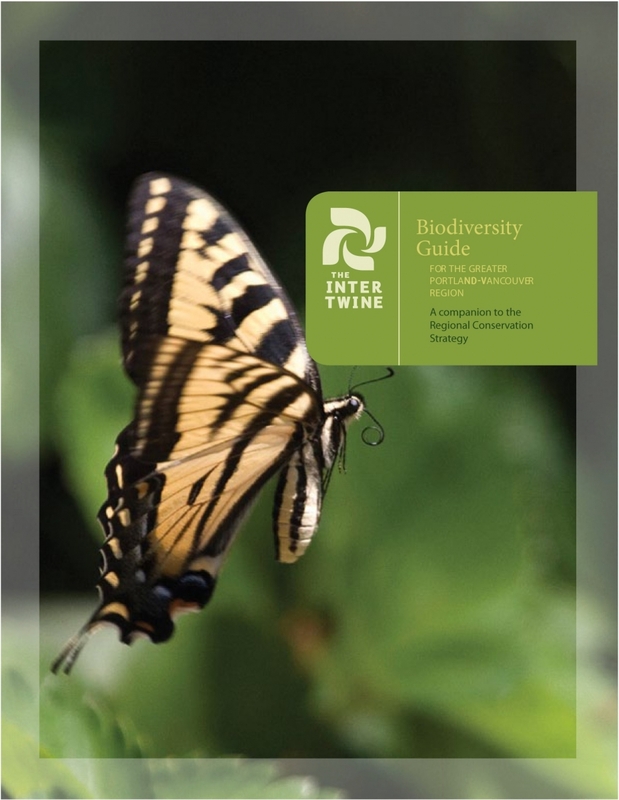 The biodiversity guide narrative describes the status of the region’s flora, fauna, and natural habitats; changes that have occurred in the regional landscape since 1850; and potential losses the region might experience if appropriate conservation and restoration actions are not taken. Also explained are the importance of fire in managing ecosystems, the ecological significance of floodplains, and challenges that climate change poses for the region’s biota. In addition, the narrative serves as the biological basis for the Regional Conservation Strategy’s discussions of issues, current conservation work, and future strategic opportunities. Taken together, the narrative, mapping, and GIS modeling provide the information and spatial context needed to help identify places of high conservation value. They also show how local projects fit within the larger spatial scale and can be used to identify where action is needed to keep habitats within urban areas connected to each other and to areas surrounding the greater Portland-Vancouver region. 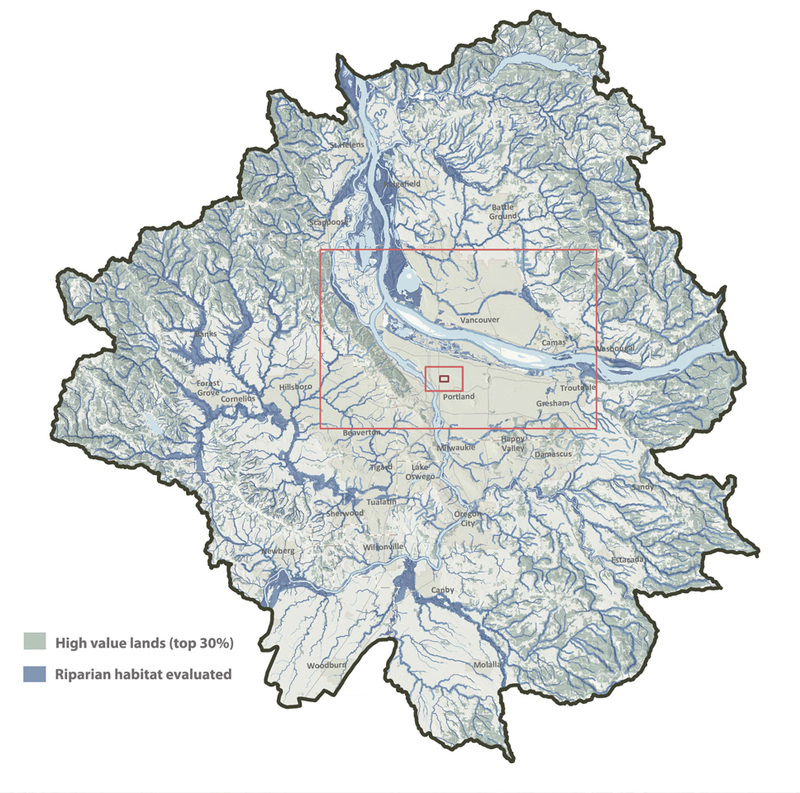 This graphic shows ecologically high-value lands in the greater Portland-Vancouver region, based on The Intertwine Alliance’s conservation priority model. High-value areas on the regional map ranked in the top one-third of all areas because of the type, location, and size of their habitat. In short, these areas represent regional priority lands within our nearly 3,000-square-mile region. In general, the results are consistent with, but more detailed and geographically comprehensive than, previous efforts to prioritize wildlife habitat within the region. Because the region has both highly developed urban areas and relatively undisturbed landscapes, much of the highest value habitats fall outside the region’s urban growth boundaries. However, more than 19,400 acres of regional high-priority lands occur within and around the region’s cities.